At Pulgini & Norton, we provide injured Boston employees with skilled guidance. With over 40 years of combined legal practice, our workers’ compensation attorneys have handled a wide range of claims for benefits, including those based on carpal tunnel syndrome. If your work resulted in an injury, we can help you seek the financial assistance you need. Carpal tunnel syndrome is a condition that causes numbness, tingling, and weakness in the hand and arm. The carpal tunnel is a passageway located on the palm side of your wrist. It protects the median nerve in your hand, as well as the tendons that allow you to move your fingers. Since the hand and wrist work together as a single unit, any damage to one area can compromise the functionality of the other. When the carpal tunnel is compressed or pinched, it can lead to tingling, numbness, and eventual weakening of both the hand and wrist. Carpal tunnel syndrome is progressive, and it usually begins with numbness or tingling in the thumb, index, and middle fingers. A person may experience tingling and numbness while typing on a laptop, holding a steering wheel, or waking up from sleep. The sensation can radiate through the arm. Most individuals with carpal tunnel will “shake out” their hands to try to relieve the symptoms. Carpal tunnel syndrome is usually caused by anything that compresses or irritates the median nerve that runs through the carpal tunnel. Certain workplace factors can lead to the condition. For example, a job-related wrist fracture or dislocation, repetitive motion, and vibrating tools can cause carpal tunnel syndrome. Vocational rehabilitation, in some cases. To qualify for benefits, you have to miss at least five days of work as a result of the injury. The days do not need to be consecutive. You will need to report the injury to your employer, who will in turn report it to its insurer and the Department of Industrial Accidents (DIA). The insurer evaluates your claim and decides if you qualify for benefits based on the condition. If the insurer accepts liability, you will receive compensation starting on the sixth day of your disability. Your wage benefits will depend on whether your injury is categorized as a partial, temporary total, or permanent total disability. An insurer may, however, deny your claim or subsequently ask the DIA for approval to reduce your benefits. Carpal tunnel syndrome is often the product of another injury, such as a fracture. In some cases, the condition occurs over time as a result of repeating the same motion, or of a pre-existing medical condition. An insurer may deny a claim for workers’ compensation if it believes that your carpal tunnel syndrome is not associated with your job, or if it objects to the medical treatment. You can file a claim with the DIA to appeal the insurer’s determination. The DIA requires that you provide medical evidence that shows your injury is job-related, and that the costs to treat it are reasonable and necessary. The work injury lawyers at Pulgini & Norton offer thorough and personalized advocacy to individuals throughout the Boston area. 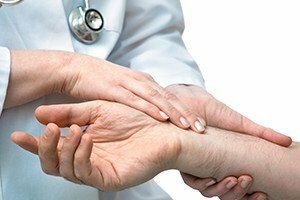 If you have been diagnosed with carpal tunnel syndrome, we can discuss whether the condition was caused by your job. We can help you claim benefits and advocate for you if an insurer has denied your claim. We represent workers in Newton, Waltham, and Somerville, among other Massachusetts communities. Call our office at 781-843-2200 or complete our online form for a consultation.